The World Wide Web today dominates the Internet How The Internet Works [Technology Explained] How The Internet Works [Technology Explained] Read More . If you want to share information online via a public service or webpage, the World Wide Web is what you use. But it has not always been dominant, it was not the only idea proposed and it has never been alone. A number of successful alternatives have sprung up for various reasons. Success is, of course, relative in this context. No one disputes the authority of the World Wide Web and its system of hypertext webpages. Hundreds of millions of people use it every day and billions of people are impacted by it indirectly. The alternatives have often been surprisingly prolific, however – gathering millions of users of their own and lasting well into the 21st century. Most anyone who’s looked into the origins of the Internet has heard of ARPANET, the forerunner of the modern Internet. You may not have yet heard about MILNET, however, the spin-off created by the United States military. ARPANET received its original funding from the United States Department of Defense (U.S. DoD) and was meant to provide redundant communications during wartime. Researchers quickly realized that a network of computers had many non-military applications, however. MILNET was split from ARPANET in 1983 to accommodate the increasingly large gap between ARPANET’s military and civilian goals. MILNET still exists today as NIPRNET and still serves the needs of the U.S. DoD. It is thought to be the largest private network in the world. It’s so large that DoD hired a contractor to “map” it in 2010. The DoD also runs another network called SIPRNET. The difference between them is the sensitivity of materials. NIPRNET is the standard military network while SIPRNET handles classified material. We can imagine that there are also similar networks in all major military powers, and some of those networks may not even be publicly known, but MILNET is the only one that was directly spun off from ARPANET. In the 1970s a number of Videotex services sprung up across the globe. These services could send pages of text across existing phone wires or, in some cases, television cable. Different networks sprung up in different parts of the world – Canada had one called Telidon and AT&T released a version called Viewtron – but most never gained traction because the networks could only be accessed via costly proprietary hardware. To make matters worse, performance was generally poor. 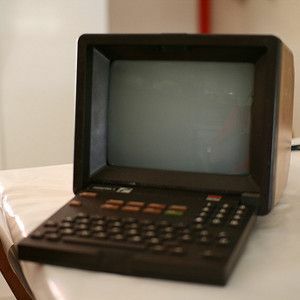 France’s Minitel, which debuted in 1978, was an exception. Unlike many competitors, the French telecom monopoly gave away the hardware and instead made money only off usage. This resulted in a much higher take-rate. By the mid-80s it was possible to visit message boards, buy plane tickets and browse the French white pages using a Minitel terminal. Services based on Minitel were rolled out at locations across the globe including the United States and Germany, but the network only caught on in its home market. It still received 10 million monthly connections in 2009 but was finally shut down on June 30th, 2012. Developed by the BBC in the 1970s, Teletext turned into the British version of Minitel. It pre-dates Minitel – serious development began in the early 70s and the service was launched in 1976. Unlike Minitel, which used proprietary terminals, Teletext was built to use a “hidden” portion of the television signal known as the Vertical Blanking Interval. Properly equipped televisions could decode this signal to display content. The name Teletext was given to a specific service, but there’s actually multiple services in Britain that used the technology including Ceefax and 5text. Each service was (or is) broadcasted by a different channel. Ceefax is still available as a part of BBC’s analog broadcasts and is regularly updated. It will go dark when the United Kingdom makes switches entirely to digital signals in late 2012. Teletext has mostly been replaced by “digital teletex” which is not based on the same technology. Services based on this technology were deployed elsewhere but never met much success – usually because of a lack of compatible television hardware. The most popular spin-off was probably Electra, which operated in the United States. It went dark in 1993 as money ran out and Zenith, the last company offered teletext compatible sets in the United States, decided to pull support. There were, of course, other forerunners to the Web. There was ARPANET, BBS message boards, Telnet What Is Telnet & What Are Its Uses? [MakeUseOf Explains] What Is Telnet & What Are Its Uses? [MakeUseOf Explains] Telnet is one of those tech terms you may occasionally hear, but not in an ad or a feature laundry list of any product you may buy. That’s because it’s a protocol, or a language... Read More and even radio which, at various times in the past and present, has been used to provide network connectivity between computers. These are technologies you’ve likely heard of, however. And then there were the failures. History is peppered with them, many of which were versions of Teletext or Minitel technology that never caught on in their respective markets. Most failed because they were unaffordable or offered frustratingly slow network speeds. If you know of any secret forerunners and competitors to the Internet, please post them in the comments. We’d love to hear about them. Check out Viewtron. Way ahead of its time till Knight-Ridder pulled the plug because "people aren't interested in getting their news that way."